For Mary Wright [BS-Art ’95], “whimsical” is a thread that runs through her life. 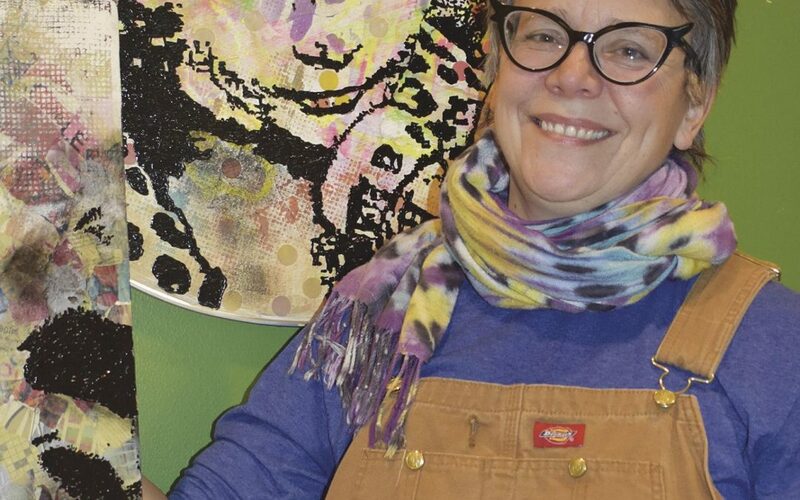 This includes her work as a Waunakee teacher, her artwork, her personality, and even her wardrobe, including trademark overalls and assortment of funky eyeglasses ranging from rhinestone rims to cat-eye glasses. At the beginning of each class, Wright plays music while students work in private sketchbooks. “This little addition changed the whole classroom environment,” she said. She believes in a diverse curriculum, so everyone can excel. “If you bomb on the clay pots, maybe you’ll do well on painting,” she said. “I always wanted to be a teacher,” Wright said. But “what kind of teacher” didn’t get answered until college. Growing up in Rockton, Illinois, it wasn’t until high school that she had much exposure to art. The fact that her older brother was an artist helped pique her interest. She started junior college in Rockford, not sure if she would go into art or English.